Ryerson Fashion Communication graduate Sabina Fenn works on her tablet in her home studio. Sabina Fenn’s downtown Toronto apartment is decorated with fashion illustrations. In one of these drawings, nine women wear fruit, like produce is the new Prada. In another, a bob-haired beauty frolics in a banana skirt. The former is an original work by the 23-year-old freelance fashion and lifestyle illustrator, and the latter is a print she picked up in Paris — by Paul Colin, one of France’s reigning supreme poster artists from 1920s. Fenn and France go way back — at least in terms of Fenn’s heritage. Her mother is French, so Fenn grew up speaking the language. The inspiration for her work is a complementing mix of the jazzy feel of Paris in the ‘20s, vintage Vogue covers, and posters from a time when illustrations, rather than photographs, circulated through the City of Lights. To be transported to Fenn’s ultra-chic Parisian reality where, glamorous women sport red pouts, frequent cool cafes and roam picturesque places, a scroll through her Instagram will do the trick. 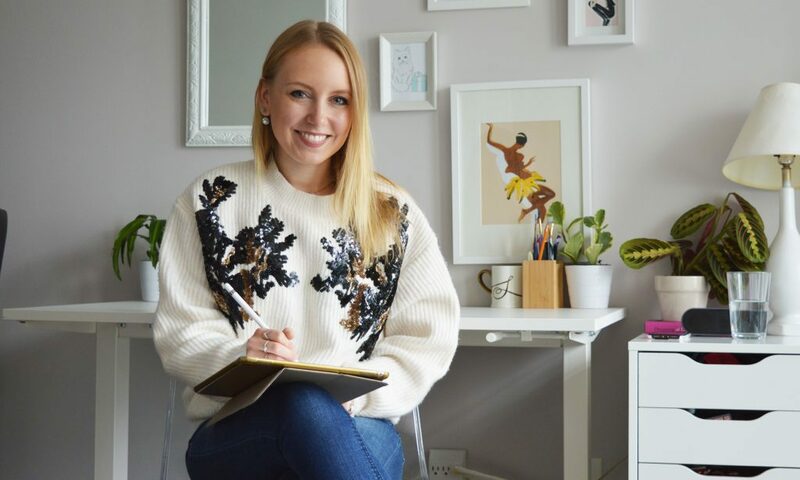 It was during her third-year in Ryerson’s fashion communication program that she discovered her passion for fashion illustration. Not long after this revelation, she started freelancing, joining the ranks of what Statistics Canada reports as 1.9 million self-employed Canadians. Like any other university student, Fenn went to class and completed assignments, but also worked freelance gigs on the side. After graduating in 2017, she took a couple odd jobs before deciding it was time to be her own girlboss and pursue her passion full time — freelance style. In a short time, Fenn has amassed an impressive roster of clients, including Cartier, Saks Fifth Avenue and Canada Fashion Group. 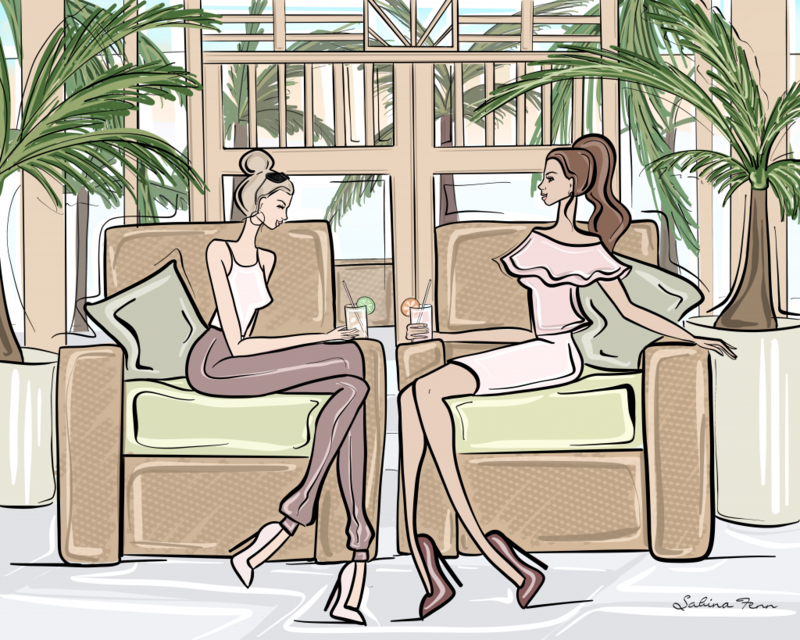 Her career has flourished — she’s embellished cards, sketched guests at events, and most recently, illustrated designer creations live as they came down the runway at Toronto Men’s Fashion Week and Toronto Women’s Fashion week. A freelance career can be enticing in that sense; the lifestyle affords diverse and unexpected opportunities. But as Ryerson journalism professor Adrian Ma said, the romanticized idea where a freelancer’s time is spent “drinking Americanos at Starbucks, working whenever inspiration strikes and having the rest of the time to yourself,” isn’t usually the reality. “Every freelancer I know doesn’t have a spare moment,” Ma said. Having had a taste of the freelance lifestyle for the past few months, Fenn knows working days can just as easily transition into working nights. Fenn’s illustration of two women chatting and drinking cocktails in Cuba. Being your own boss is no easy feat, and in Fenn’s case, the title initially brought along its own set of stresses. “What if I fail?” she remembers thinking. Despite her numerous mentors (including her parents) who could provide support and advice, Fenn says adjusting to this line of work was essentially trial and error. “I really had to put myself in a lot of uncomfortable situations so that I could learn how to do things properly,” she said. Being self-employed, as she quickly discovered, is like running a business; there are invoices, taxes, phone calls and emails to oversee. But it’s the freedom and flexibility of freelancing that allows Fenn to prioritize and pursue what she wants, when she wants to, and that’s what makes the hustle worthwhile. She can still take her daily walks along Lakeshore, visit coffee shops around the city and spend time with her friends — at the end of the day, she’s working on her own time. According to Statistics Canada, six per cent of Canadians worked from home in 2016. To accommodate the rise of freelancers and entrepreneurs, a growing number of co-working spaces with annual or monthly rates (such as Make Lemonade and Project Spaces) have set up shop in major cities like Toronto. Fenn on the other hand, doubles her apartment as a studio. She sometimes works sitting and other times standing at her height-adjustable desk, as Nala, her cage-free adopted rabbit, hangs around the space. 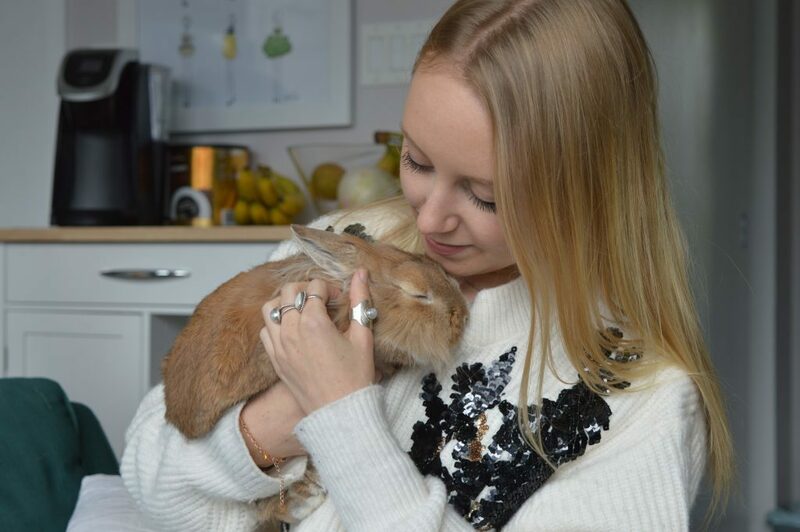 Fenn with her rabbit, Nala. There are perks to working from home: you don’t have to wear makeup, you can wear the comfiest of yoga pants and take breaks when you please to snack or run errands. Despite this, watching the “suits” rush in and out of work like clockwork every morning and evening outside her conveniently placed financial district apartment made Fenn feel guilty early on. To gut fatigue and spawn motivation, Fenn uses podcasts and YouTube. From Lewis Howes’ podcast School of Greatness, which shares inspiring stories, to day-in-the-life vlogs, Fenn absorbs tips on how to live her best life. Cooking, reading, meditating, and working out are some hobbies that aim to do just that. As of late, there’s been an added silver lining to this pastime: Fenn is publishing her first book. Slated for release this December, her coffee table book is a love letter to Coco Chanel’s iconic little black dress. Within it, her signature black-and-white-with-a-pop-of-red illustrations will decode how women have worn the iconic garment over the years. Fenn admits a book was never in the plan, but with freelance careers, the best things never are.